The team traveled to Uganda and Kenya with the Sports Outreach Institute, a sports ministry committed to reducing human suffering. Along with Coach Todd Olsen, the student-athletes conducted soccer camps and assisted with humanitarian work, including health education. They also interacted with the girls who are receiving an education thanks to the team’s sponsorship and fundraising. Their days were packed with teaching, traveling, and competing, but they had a life-changing experience. Emily Maxwell ’18 described the awe of finding new energy every day, allowing her to give her time and full attention to the children she worked with. 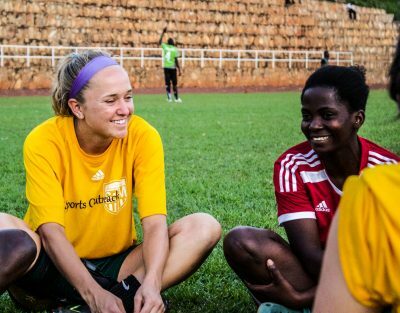 The women’s soccer team has partnered with Sports Outreach for about ten years. The partnership grew out of Coach Olsen’s soul searching and reflection. He had helped the women’s soccer team become a phenomenal powerhouse in the Old Dominion Athletic Conference, but he thought there must be something more. 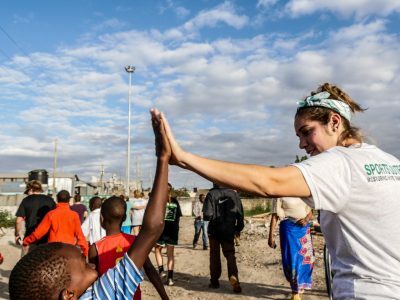 After he met the leaders of Sports Outreach, the women’s soccer team hosted “Gifts for Gulu,” an event that collected thousands of dollars worth of used athletic equipment to be given to children in Africa. Coach Olsen later traveled to Africa and began using his training as an epidemiologist and a coach to teach people about health as well as soccer. His team got more involved, traveling to Uganda and Kenya to teach soccer, build wells for drinking water, and promote education. Still, the team’s record is pretty impressive. It has won 14 ODAC championships in the past 20 years as well as the 2014 D-III national championship. But Coach Olsen puts service at the forefront of the program. Today, he recruits stellar athletes to the team who are attracted to the program because of the opportunity to serve. The Lynchburg students visited a group of girls in Uganda who are receiving an education thanks to the team’s Women of Worth program. The WOW Girls, as the sponsored students are known, surprised them by singing a song that the teammates taught them on their last visit to Africa. The team also played soccer against teams that proved to be competitive, despite women’s soccer being very new in Uganda and Kenya. Emily was thrilled to see how much talent the athletes had developed, forcing lifelong soccer players like herself to work hard to compete. She felt unified with her opponents, who reminded her of the true purpose of the trip, and of soccer itself.